Holy cow I'm first! I have really missed Fiber Fridays and all my yarn friends. This week I made Cocoon a blend of space dyed wool in mulberry and a soft yellow with slubs of butter colored silk. I can't wait to see your latest and greatest. Happy Friday! Glad to have you back ivycircle! 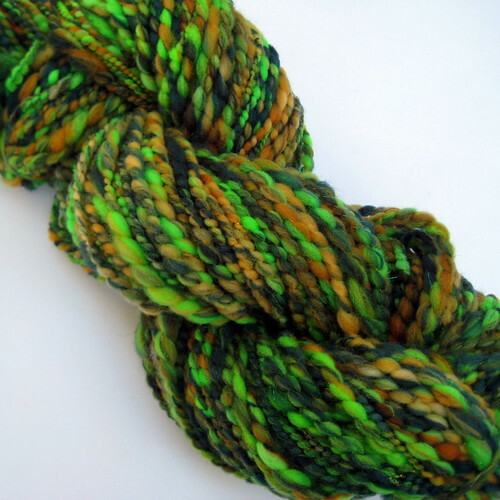 I spun some holiday inspired yarns this week. 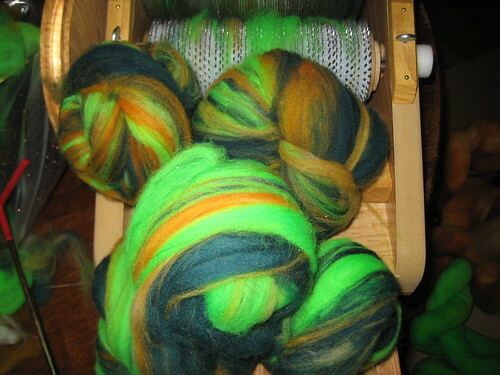 SO, this past weekend, I bought a drum carder at the WI Sheep & Wool fest. I really can't stop talking about my trip there! Here are the two yarns I've spun so far using my own carded batts! Aren't drum carders the best!!! Cloudlover, your yarns are heavenly. AHHHH... Fiber Friday, it's like a mini vacation while I'm stuck at work. I love the yarns so far this week and I am SO jealous about the drum carder! Oh, how I love fiber fridays! It's still not lace-weight, but I'm learning. I plan to knit the shetland scarf from "Victorian lace today" from these skeins for my mother. 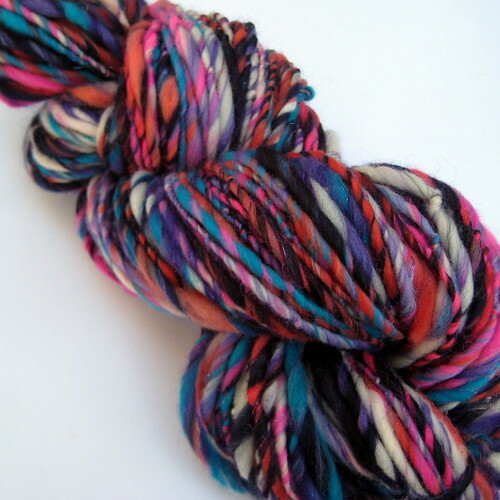 They were spun from handcarded batts for which I carded variegated red merino and white merino together. I don't really like the colour, but my mother loved it so it's the perfect yarn to make a gift for her. How do you like my lovely hat? Cloudlover, I love that Dead or Alive batt (anybody else have Bon Jovi belting in their heads? )! And the resulting yarn is super yummy. Two animal-friendly yarns this week. 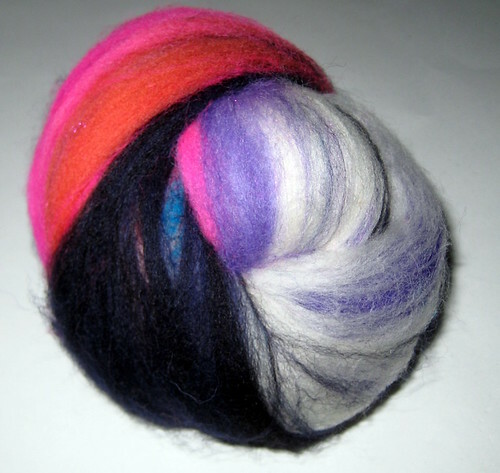 Fiber is from a rescue farm for sheepies, handdyed by me. Galapagos Cotswold wool singles yarn. I flickcarded the locks open and then spun them, which kept a lot of sweet little curly-q bits in the yarn. 103 yards, 3.6 oz. Okay, everybody put on your sunglasses, this next one is BRIGHT. Goth Girl Fiber is from a Rambouillet/Texel/Finn Cross sheep named Emma. I spun it thick/thin, and had a wrapping going on near the oriface the whole time. The wrap is black crochet cotton. 72 yards, 3.2 oz. I have no idea what you're talking about, so here's me with some yarn on my head. Haha, you're the second person that's mentioned Bon Jovi in re: to the batt, but it's actually inspired by Dead or Alive, the 80's band responsible for the song "You Spin Me Round!" Mohawks and spandex, anyone? 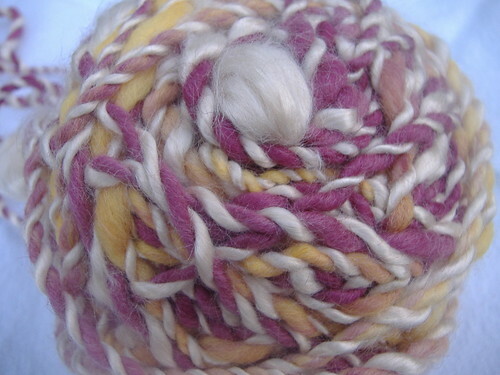 I know NOTHING about the spinning/carding of wool.....but ladies, I want to pick it up just seeing what you create! that yarn is all so GORGEOUS!!!!! I wish I could knit! I have no idea what I'd do with it but boy, do I wish I had it! hi, I'm an OCD crafter too!